Portugal defeated Poland 5-4 on penalties after a 1-1 draw over 120 minutes. Ricardo Quaresma scored the winning spot kick. Robert Lewandowki shook up Portugal after 67 seconds in an electric start, but Blaszczykowski's costly miss in penalty shootout prevents Poland from seizing history. 18-year old Renato Sanches showcased his exciting talents, scoring a sublime equaliser outside the box, also creating chances, linking up and exploiting space in behind Poland's defence. In an extraordinary start, Robert Lewandowski scored his first goal of the tournament and second quickest of its entire history, latching onto Grosicki's low cross to clinically slot past a helpless Rui Patricio. 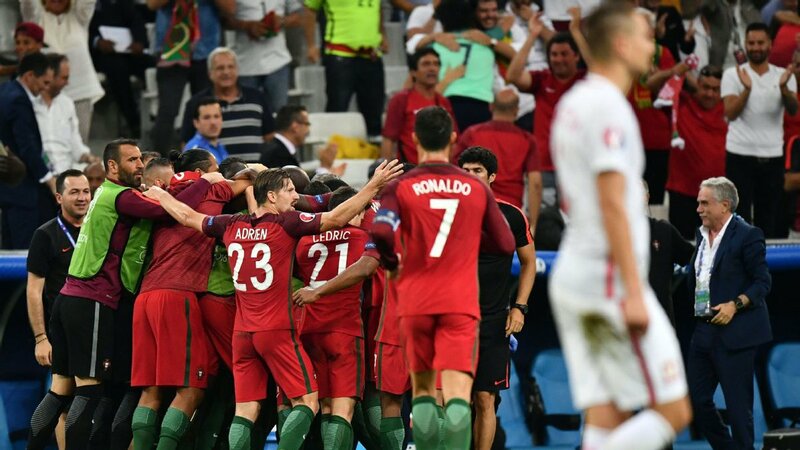 Portugal were visibly shook, and even Cristiano Ronaldo couldn't lead the comeback as his low effort was easily saved before a lackluster free-kick rebounded off the wall. Yet while Portugal remained a menace in attack, the speed and tenacity of Poland's finest talents unsettled their back four. Lewandowki merely edged Pepe to latch onto the end of Milik's run, easily spinning the veteran defender to his right, however Rui Patricio was equal to the strike. Pepe then redeemed himself after briefly switching off to deny Milik from an accurate shot at goal, vitally sticking a leg out to deflect it wide before Cristiano Ronaldo's grasscutter was saved well following Nani's sharp cut in from the left. Exploiting space behind Portugal's defence on many occasions, Poland attempted to double their lead but to no avail. Milik and Grosicki remained dangerous, but came down to nothing as Renato Sanches, latching on the end of Nani's cute flick back to unleash a fine strike deflected by Krychowiak and beyond Fabianski's reach, equalised for his side and brought them right back into the game. It had been coming. Poland slacked off considerably, and Renato Sanches himself turned out to be a nuisance for the Polish midfield to content with; linking up, create space, making runs, and at 18, proving Bayern Munich's pursuit of him was extremely smart business. As time progressed, tension increased and chances diminished. In the mere ones presented, were at Cristiano Ronaldo's feet but after a surging run into the area his angle is tight and shot subsequently wide. Adrien Silva's shot was blocked before Cedric blootered merely over Fabianski's crossbar. With twenty minutes remaining, Poland upped the ante in search of the vital winner but couldn't find anything significant to beat Rui Patricio, as Milik's side-footed tap from close range was saved, subsequent to Lewandowski agonizingly missing the chance to test the Portuguese goalkeeper due to Grosicki's through ball falling short of its destination. Moments later, Grosicki himself dreadfully blasted over the crossbar despite the availability of three options ahead. That was before Portugal enjoyed brief success on the ball, but when Nani attempted to materialise it, he was soundly dispossessed as Pepe and Fonte both saw headers comfortably saved from following corners. In the late stages with extra time looming, Ricardo Quaresma and Joao Moutinho were introduced to unlock the key to the semi-finals. This, coincidentally, boosted their options but the desired goal almost came from Jedrzejczyk in his own net as after Pepe won the possession in midfield, his attempted through pass was cut out by the Pole who stuck a leg out and nervously watched the ball curl around the post. Cristiano Ronaldo, enduring a woeful performance with consecutive missed chances, yet again failed to convert a chance he is always tipped to convert. This time he even failed to connect with the ball, in on goal, after a looping pass over the defence gave him the perfect chance to emphasise his greatness. He completely missed. As each side minorly probed, a match winner seemed increasingly unlikely and the referee signalled extra time. They could not be split after 90 minutes. With no time to waste, Portugal pressurised Poland with two back-to-back chances, the first Ronaldo merely missed after a cross, then goalscorer Renato Sanches saw his shot of desperation take a substantial block. Quaresma, joining in on the action, was also denied by Glik who threw his body in the way of the fire. Midway though extra time, Portugal's dominance would refuse to be diminished. Each attacker had chances but a strong, resolute Polish defence seemed content in dragging the game out to penalties before they branches out themselves in the source of Milik. He looked dangerous to an extent, but his indecisiveness with Lewandowski yards away, Pepe swiftly closed him down and eradicated any danger. In the second stanza, Poland increased their attacking input but lacked the required quality. Even with Lewandowski they couldn't discomfort or test Rui Patricio as Blaszczykowski and Kapustka both missed chances to seal it. As the going got tough, leadership became pivotal. Portugal had it in abundance, but more importantly at the back as Pepe remained a rock. He blocked Kapustka's dangerous shot inside the box, subsequent to clearing Piszczek's cross targeted at Lewandowski and Kaputstka himself moments later. In fact, Lukasz Piszczek had the last meaningful chance of the game from outside teh area but blasted a woeful, tired and desperate attempt high into the stands. The 120 minutes had expired. Penalties awaited. Who kept their nerve? Portugal beat Poland 5-3 on penalties.